We know the situation well. You opened a bunch of wine for a party or your monthly book club, and at the end of the night, there were still droplets leftover. Instincts may tell us just to drink it, but there are other creative options for polishing off those bottles. If the wine you have remaining is too little to measure, you may consider freezing it in trays; then you can keep your next glass chilled without worrying about watering down the beverage. There are easy ways to make homemade vinegar too, but there’s no instant gratification in that process. You literally have to wait for months before it’s fermented properly, and the steps in between can be tedious. You can of course also make other cocktails or sangrias, but this would require more wine—which is presumably not available in what we’ve conceived as our personal nightmare. No need to panic, though. We have found some of the best recipes for leftover wine to relieve you of this burden. To use a food-related cliché, we have truly turned lemons into lemonade. Browse our roundup below, which includes opportunities to use red or white wine, depending on your surplus. As Kate Ramos at Hola Jalapeno explains, this is a Latin spin on the traditional Italian soup. White wine works best, readying the pot for hearty vegetables like potatoes. 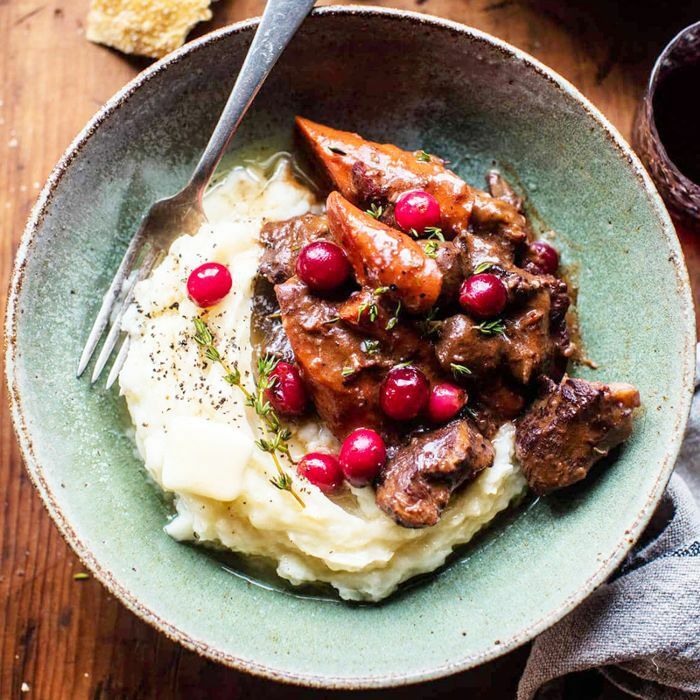 This slow cooker beef stew from Boulder Locavore is perfect to use up those final drops of wine, especially if you're hungover from drinking the rest of the bottle the night before. Throw all of the ingredients into the pot and curl up with a bottle of aspirin until it's ready. It happens every few years—two different acquaintances gift us the same bottle of wine, but we're not particularly fond of the taste. Don't let it collect dust when you won't drink it; instead, throw it into these delectable braised short ribs, recipe courtesy of Root and Revel. You'll only need one pot to prepare Boulder Locavore's apple sausage penne skillet. Use a splash of wine to deglaze your skillet to preserve the sweet and savory flavor of your protein. Douse the dish in a cheese sauce and feel your soul being transported to heaven. If you're only making this chicken cordon bleu from Food Faith Fitness so you can use white wine in the cauliflower Alfredo sauce, well, we should be best friends. This takes waste not, want not to heart, requiring only one tablespoon of the god's nectar. For a treat with as tantalizing a name as mulled cherry bomb pie, the instructions on this Half-Baked Harvest recipe are rather simple. If you have a measuring cup-worth of red wine, then this dessert is a no-brainer. On one hand, if your book club communicated better about who was bringing the wine, maybe you wouldn't be left with all these extra bottles. Then again, you also wouldn't be able to make Half-Baked Harvest's delicious beef bourguignon with the ample pinot noir, so fair is fair. Wine is an essential ingredient in the broth for mussels, at least when cooked according to the Italian tradition. Use whatever you have left, given that it's of the white variety, for this classic seafood dish from Hello Glow. This summery dish from How Sweet Eats calls for two different types of spirits. A combination of wine and sherry helps draw out the muted sweetness of this peach basil chicken. Pumpkin and quinoa? Now that's an autumnal meal. This recipe from Hello Veggie calls for a cup or so of wine to keep your quinoa hydrated from the start. Nothing quite as comforting as warm beef stew. With all the spices and sauces hidden in this concoction from Chelsea's Messy Apron, you may not have any leftover after dinner. Considering that was the goal with the last of your wine—two birds, one stone! Thanksgiving does not have a monopoly on turkey. This roasted bird, courtesy of Half-Baked Harvest, is frankly delicious any time of year, most especially when you're making it with the intention to use up the rest of your sauvignon blanc. Boulder Locavore chef Toni Dash values efficiency as much as flavor. That's why for this plank-cooked salmon recipe, she opts to spritz the fish with white wine to create necessary steam to cook it through. Split-pea soup ferries several wonderful flavors to your taste buds, with ham complementing all the veggies well. It can also help make room on your shelf for a new bottle of wine, especially if you only had a quarter of a cup left as called for by Boulder Locavore. To make this cold yet vibrant soup from Hello Glow, you will need some rosé. The tang you get from the alcohol doesn't overtake the dish but instead balances the sweets with precision. Homemade gnocchi made from sweet potatoes already sounds like a winning dish. The addition of pinot grigio into the pan sauce, as with this recipe from Half-Baked Harvest, make it a game changer. The flavors of turkey bolognese are naturally bold, but throw in whatever red wine you have remaining to bind them all together. These stuffed peppers from Joyful Healthy Eats make great small plates for parties in spite of the recipe's lengthy ingredient list.